Presents an outstanding review of state-of-the-art basic science, including epidemiology as well as molecular and cellular biology. Covers the newest treatment techniques, from neurosurgery through radiation therapy · chemotherapy · neuro-interventional techniques · immunotherapy · and gene therapy, and discusses functional outcomes and clinical trial findings. 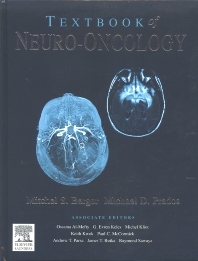 Explores all of the most challenging neurologic cancers that clinicians face, including meningiomas · chordomas and chondrosarcomas of the cranial base · benign and malignant peripheral nerve tumors · medulloblastomas · neurocutaneous syndromes · ependymomas · and malignant rhabdoid tumors. Features a user-friendly full-color layout throughout for ease of reference. Mitchel S. Berger M.D., F.A.C.S., F.A.A.N.S. is the Berthold and Belle N. Guggenhime Professor and Chairman of the Department of Neurological Surgery at the University of California, San Francisco (UCSF), and is an expert in the fields of neurosurgery and neuro-oncology. He also serves as Director of UCSF’s Brain Tumor Research Center. After graduating from Harvard University in 1974, Dr. Berger earned his medical degree from the University of Miami School of Medicine. He completed a clinical fellowship in neuro-oncology at UCSF, a fellowship in pediatric neurosurgery at the Hospital for Sick Children of the University of Toronto, and his neurosurgical residency at UCSF. In 1986, he became Assistant Professor of Neurosurgery at the University of Washington School of Medicine, after which he was named Associate Professor (1990) and Professor (1996). Dr. Berger has clinical expertise in treating adult and pediatric brain and spinal cord tumors. He is a pioneer of intraoperative brain mapping — a technique used to avoid functional areas of the brain during surgical resection of a tumor. His work has enabled surgeons to perform more extensive resection of tumor with less chance of producing sensorimotor or language deficit. Dr. Berger is a leader of translational research and is the Principal Investigator of the UCSF Brain Tumor Research Center’s Specialized Program of Research Excellence in neuro-oncology, funded by the National Cancer Institute. His specific research interests lie in identifying molecular markers related to the progression and prognosis of glial tumors, as well as the development of small-molecule therapeutic agents that can be administered directly to the brain via convection-enhanced drug delivery. During his distinguished career, Dr. Berger has served as President of the American Association of Neurological Surgeons, President of the Society of Neuro-Oncology, President of the North Pacific Society of Neurology, and Vice President of the Congress of Neurological Surgeons. He has also been a director of the American Board of Neurological Surgery and a member of the Board of Directors of the American Association of Neurological Surgeons. He is currently President of the American Academy of Neurological Surgery. In 2009, Dr. Berger was awarded the prestigious Winn Prize by the Society for Neurological Surgery. He currently serves as a member of the National Football League Head, Neck and Spine Committee, focusing on retired players’ issues and examining the consequences of repetitive head injury and concussion. He is also an active member of numerous professional organizations, including the American Organization for Cancer Research, the American College of Surgeons, and the World Federation of Neurosurgical Societies. A prolific author, Dr. Berger has contributed over 500 scientific articles to peer-reviewed journals, has edited 6 textbooks, and has written over 80 chapters on various neurosurgical topics. He is currently on the editorial boards of several leading journals including Neuro-Oncology and Neurosurgery.